I offer two types of energy work, Egyptian Reiki and Buddhist Reiki, both of which were created by me. They are transmitted via attunements like Usui Reiki. Attunements can be performed via remote sessions or skype. Please note: The name "Reiki" just refers to the fact that they are transmitted, just like Usui Reiki, by multiple-stage attunements performed by a qualified teacher. Thus it only refers to the type of work, without any direct relationship with Usui Reiki. Therefore, Usui Reiki is not prerequisite to receive these energies. You might already know that the word "Reiki" just means "spiritual energy" in Japanese. 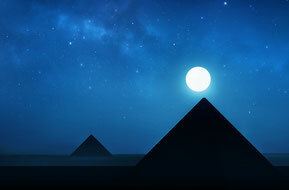 This transmits the various kinds of energy that existed in the Egyptian civilization. It leads you to be awake that you are a cosmic being yourself. This energy was originally created and held by cosmic beings, especially those related to Sirius. In a way, this work revived the energy in sacred ceremonies performed inside the pyramids in ancient Egypt. Click on the photo to the right to read the details. 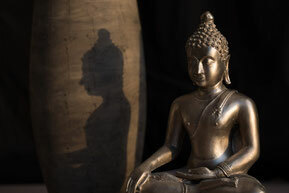 Buddhist Reiki offers you the opportunities to connect with the energies of Buddhist deities. It can be said that it is roughly a Buddhist version of angel and archangel energy work in Western culture. Though Buddha is ultimately just the Source itself beyond any manifested forms, it can manifest as many deities to help humanity in a variety of situations.